Philadelphia Eagles defensive back Ron Brooks (33), safety Malcolm Jenkins (27) and defensive end Steven Means (51) raise their fists during the national anthem before an NFL game against the Chicago Bears, Monday, Sept. 19, 2016, in Chicago. 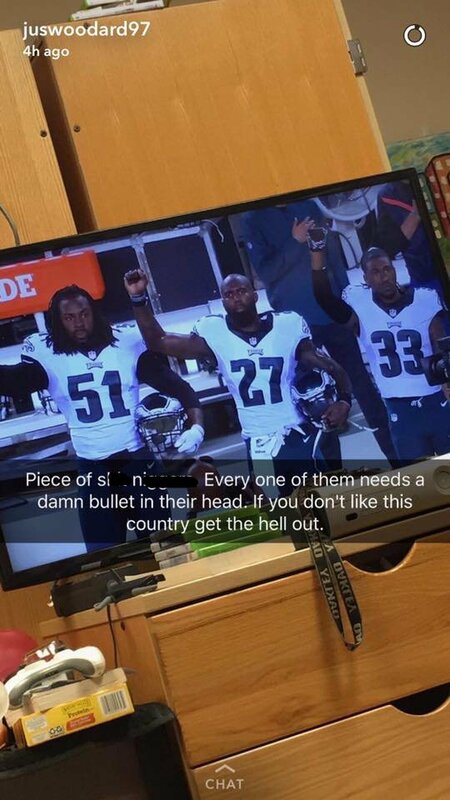 A student at Belmont University in Tennessee was removed from the school after his racist social media post about Philadelphia Eagles players protesting the national anthem went viral. The screenshot of the student's Snapchat post was shared widely on Facebook and Twitter after the Eagles' game against the Chicago Bears Monday night. 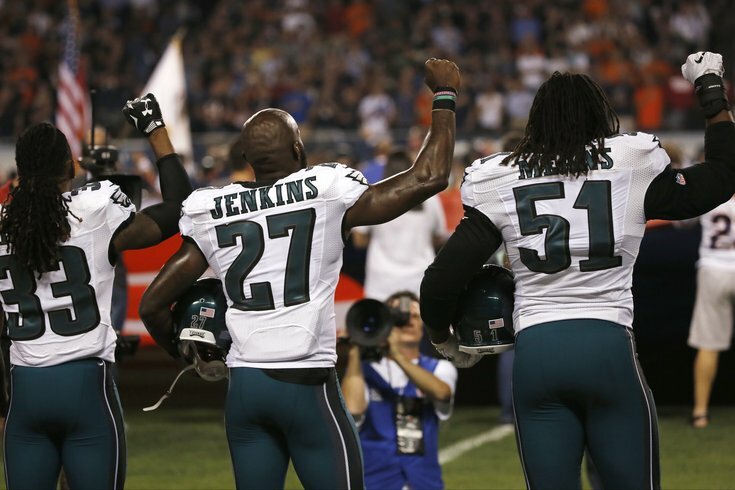 Eagles safety Malcolm Jenkins, along with players Steven Means and Ron Brooks — all of whom are black — raised their right fists in the air during the anthem to make a statement about perceived racial and social injustices. Piece of s*** n******. Every one of them needs a damn bullet in their head. If you don't like this country get the hell out. The Christian school said in a statement Tuesday that it had been made aware of the post and would take "immediate action." Shortly after that, the school said the student was no longer with the university. "The University rejects comments rooted in racism or bigotry," the statement read. "As a Christian institution, it is our goal to build a diverse and inclusive community where all members feel accepted, safe and valued." The controversy over the post is the latest chapter in a national conversation about protests during the national anthem, a trend started by San Francisco 49ers quarterback Colin Kaepernick, who has knelt during the song before each game this season. Several players across the NFL have joined in similar demonstrations. In an interview with PhillyVoice, Jenkins explained his reasoning for joining Kaepernick's movement. “I’m not anti-police, or anti-military, not at all, and I want to make sure people get that point,” he said. “Like I said, I’ve had multiple conversations with Philadelphia police. I have a lot of friends who have served in the military, my grandfather served in the military. By no means would I do anything to disrespect them." He added that the focus of his demonstration was systematic injustice. “Especially the justice system that’s in place that directly affects the under-served community, which most times affect African-Americans,” Jenkins said. “I already do a lot in the community and I feel this falls in line with what I’ve been doing since I got into the league." Jenkins’ decision to protest did receive some backlash locally. The Philadelphia police union held a fundraiser the night of the game to benefit two officers who were ambushed by a gunman in West Philadelphia Saturday. “It’s offensive to police and it’s offensive to the military," said John McGrody, vice president of the Fraternal Order of Police Lodge 5. "The same flag is given to families of fallen soldiers or police officers who give their lives protecting their communities and countries."